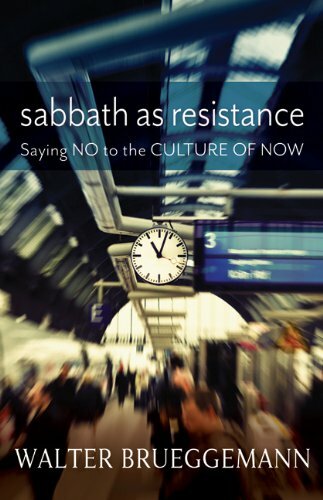 Walter Brueggemann's slim new volume "sabbath as resistance: Saying NO to the CULTURE OF NOW" arrived yesterday. Reading about sabbath on the Sabbath is deeply settling. And - part of my reading today was from Matthew 12, so it all fits beautifully together. "The Sabbath concerns the maintenance of a distinct faith identity in the midst of a culture that is inhospitable to all distinct identities in its impatient reduction of all human life to the requirements of the market." "The Sabbath [is] an alternative to the endless demands of economic reality, more specifically the demands of market ideology that depend, as Adam Smith had already seen, on the generation of needs and desires that will leave us endlessly "rest-less", inadequate, unfulfilled, and in pursuit of that which may satiate desire. Those requirements concern endless predation so that we are a society of 24/7 multitasking in order to achieve, accomplish, perform and possess. But the demands of market ideology pertain as much to consumption as they do to production. Thus the system of commodity requires that we want more, have more, own more, use more, eat and drink more. The rat race of such predation and usurpation is a restlessness that issues inescapably in anxiety that is often at the edge of being unmanageable; when pursued vigorously enough, moreover, one is propelled to violence against the neighbor in eagerness for what properly belongs to the neighbor." This is a piercing analysis of our economic reality and the forces that sweep us into their relentless swirl. But it's also a prophetic indictment of the hungers within us that attach to these forces with instant obsession. It's such a dark way to pursue joy.